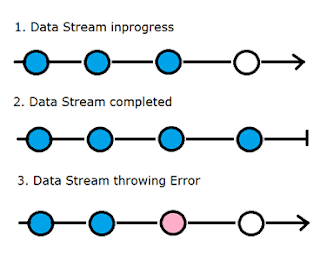 Reactive Programming is a pattern of development that works with asynchronous data stream created of UI Events, HTTP Requests, File System, cache etc. So data stream is an ongoing event sequence in time orderly manner. Stream can emit value, error, and status signal. Observables are to watch these streams and trigger function on anything occurs in the stream. Observers can subscribe to observables. RxJs is the library which helps us to do the exact same implementation in our project. Reactive Extensions (Rx) is a library for composing asynchronous and event-based programs using observable sequences and LINQ-style query operators. Reactive Extensions represents all these data sequences as observable sequences. An application can subscribe to these observable sequences to receive asynchronous notifications as new data arrive. // Each next inside Observable will trigger subscribed function. See comments for detail understanding.